Using real-time soil and climate monitoring allows agricultural enterprises to better understand plant response to ever-changing environmental conditions, and react accordingly. Using real-time soil and climate monitoring allows agricultural enterprises to better understand plant response to ever-changing environmental conditions, and react accordingly. The result is improved yields, better application of nutrients and water, and consistent quality to the consumers. Vineyard health management is a complex science, with individual grape varieties exhibiting preferences and sensitivities to a wide range of environmental conditions. In situ trends in temperature, humidity, light intensity, precipitation, soil moisture, and leaf wetness are all intricately linked in plant health models that inform decisions on usage and timing of irrigation, fertilization, and pest control. 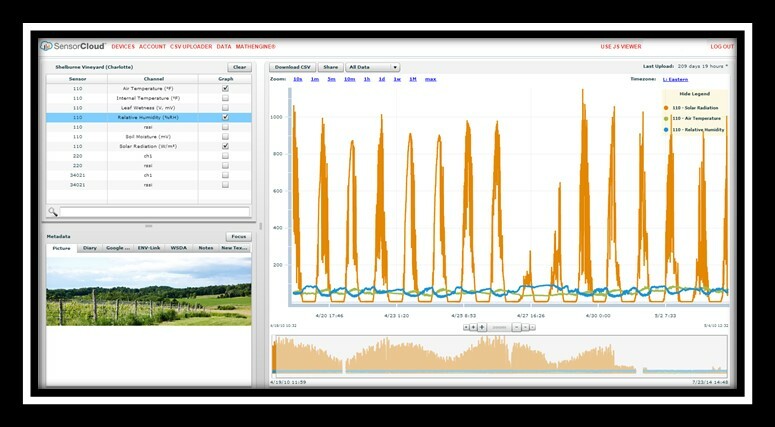 Precision wine production - Using SensorCloud with MathEngine analytics tools provides valuable insight into crop performance over time, and allows producers to achieve consistent quality and output for each variety. Crop productivity monitoring - Precision agricultural requires understanding soil and micro-climate conditions of dispersed cultivation sites. Using the SensorCloud platform with a scalable wireless sensor network allowed this vineyard to remotely monitor growing conditions and respond accordingly. Since 2011, Shelburne Vineyard has relied on the SensorCloud platform as part of its arsenal for vineyard health management, driving decisions that optimize yield, minimize resource consumption, and allow them to reliably produce and sell high quality and specialty products. 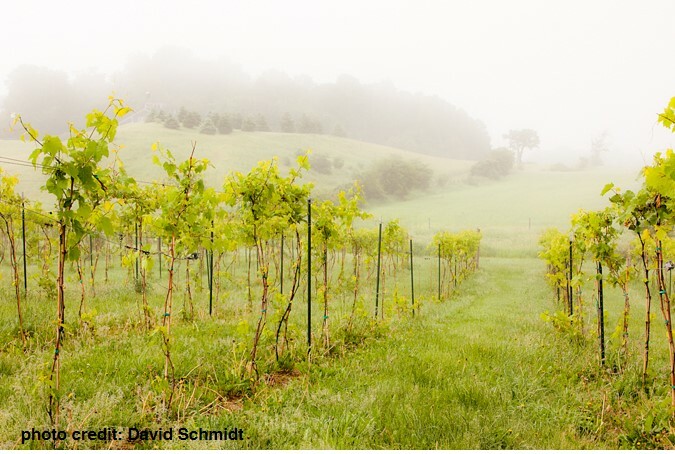 Connect: Shelburne Vineyard deployed wireless environmental sensor networks across multiple sites with varied micro-climates and terrain. Data from each environmental wireless sensor networks was collected by wireless sensor networks and synchronized with SensorCloud over a cellular link. Monitor: Vineyard managers setup custom SMS and email alerting that notify staff when critical environmental thresholds have been reached, warranting preventive or pro- active measures. Additionally, certain wines require exact conditions to optimize grape sweetness at harvest. Monitoring temperatures during extremely narrow seasonal windows allows them to produce a consistent and unique product. Analyze: Using the MathEngine ® data analytics embedded in SensorCloud, vineyard scientists are able to collaborate with academic colleagues, fine tuning pest risk and soil nutrient models for specific sites, and unlocking key insights for optimizing vineyard health.